Slow take-up for OLED in Korea due to high prices? OLED is the next great hope for TV brands but it seems the slow nature of the technology's development shows no signs of changing. Yield rates are still low which means prices are high, and LG revealed today that it has sold just 200 OLED TVs since the products went on sale in Korea in February. Whichever way you look at it, that's not a particularly exciting number. "Our OLED products went on sale about two months ago in Korea and to date we have sold about 200 units," said Hugo Shin, the director of home entertainment product communications at LG. TechRadar is visiting LG at its Seoul headquarters this week, and the sales figures came to light during a technology Q&A session. It's not much of a reflection on demand, more the reality of sky high OLED prices and the distraction of other technologies such as Ultra HD. 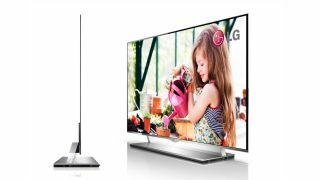 LG says it wants to be the number one consumer electronics brand on the planet by 2015, and wants its OLED technology to play a key role in that. It already considers itself a strong number two, and has plans in place to attack Samsung's consumer tech market share in the coming years. However, Shin also said that it would be two to three years at least before prices of LGs OLED TVs would come down to the level of today's high-end LED products. "That could change," said Shin, "if our competitors create more competition in the market, in which case it could be two years, but three years is more realistic." That will largely depend on how effectively LG can master the manufacturing process – the wasted, time, energy and materials of low yield rates have placed OLED out of the reach of regular folks ever since Sony put the XEL- 1 - the world's first OLED TV - on sale in 2008. It was just 11-inches in size and cost $2,500. While the Japanese brands Sony and Panasonic are focussing on OLED TVs with 4K resolutions, LG says it is focussing on Full HD OLED for the time being and couldn't be drawn on when it might demo Ultra HD OLED products. That's no big surprise given it's only sold 200 OLED TVs as it is – admitting that 4K OLEDs are on the way and will likely stagnate sales further. But we'd be surprised if the products weren't in the pipeline. Sony and Panasonic have a slight advantage in this regard as they have co-developed an innovative printing technology for manufacturing OLED panels with ultra high definition resolutions. LG also revealed that it will soon be launching large-sized 21:9 TV products to join the 21:9 TV/monitors combo products it has already launched. First will come a 34-inch desktop monitor/TV, followed "probably" by large-sized TVs. 21:9 is a divisive display format, lending itself to hollywood movies and 3D but not particularly to the 16:9 formats used for HDTV.